A job well done. A supportive friend. 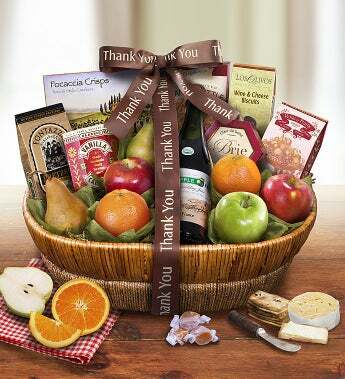 Whatever your reason, send a very special Thank You with this succulent fresh fruit thank you gift basket from the orchards of The Fruit Tree™. They’ll appreciate this elegant, overflowing willow and sea grass basketful of a selection of the freshest fruit, directly from the orchards of The Fruit Tree™. They'll also like the Comice and Bosc Pears, navel oranges and 3 different varieties of seasonal apples. Complement the fruit with rich Brie Creamy Cheese Spread, Focaccia Crisps, Organic Sparkling Cider, and much more! Artfully presented in an elegant, collectible willow and sea grass basket with a distinctive Thank You ribbon. It's true delight. Bite after amazing bite. A job well done. A supportive friend. Whatever your reason, send a very special Thank You with this succulent fresh fruit thank you gift basket from the orchards of The Fruit Tree™. They’ll appreciate this elegant, overflowing willow and sea grass basket full of a selection of the freshest fruit, directly from the orchards of The Fruit Tree™. They'll also like the Comice and Bosc Pears, navel oranges and 3 different varieties of seasonal apples. Complement the fruit with rich Brie Creamy Cheese Spread, Focaccia Crisps, Organic Sparkling Cider, and much more! It's true delight. Bite after amazing bite.